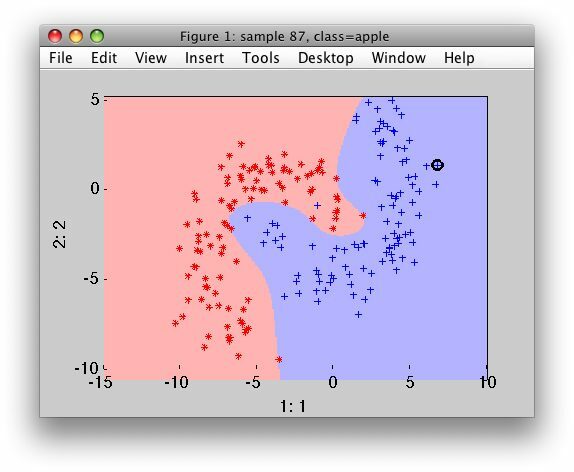 This section describes support vector machines for classification. 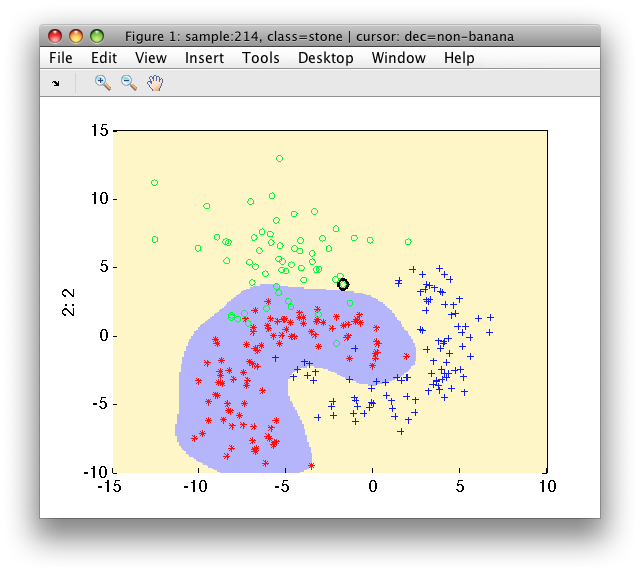 perClass sdsvc command trains a support vector machine classifier using libSVM library. The sdsvc supports linear, RBF and polynomial kernels. 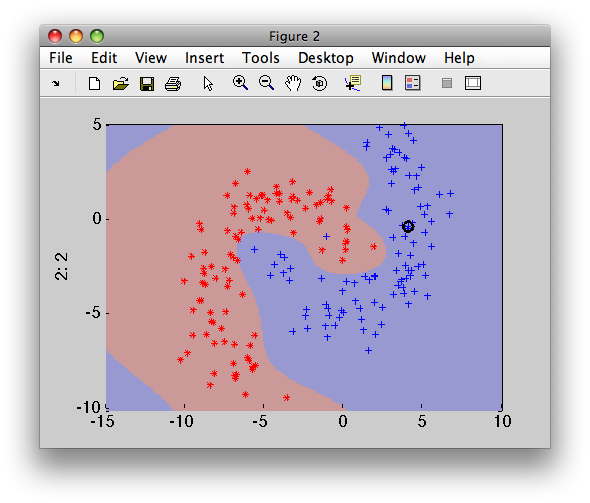 The trained support vector machines are executed through the perClass runtime library. By default, RBF kernel is used with sigma and C parameters selected automatically based on a grid search. The mean error on a validation set (25% of the training set) is optimized during the grid search. sdsvc displays the sigma and C parameters together with the error on validation set and number of support vectors. Keep in mind that the number of support vectors is important indicator of well-trained support vector machine. Large number of SVs may mean that we use wrong sigma or C or that the libsvm optimizer did not find a good solution. 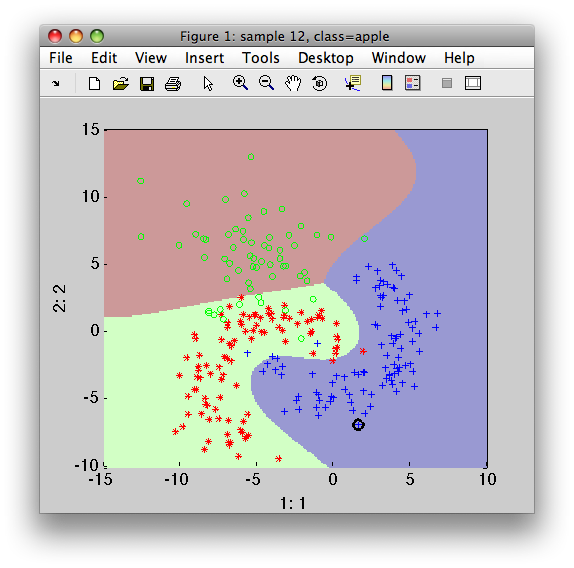 The two-class support vector machine yields one soft output which needs to be thresholded in order to make a decision. This happens in the third step. The number of support vectors used may be queried directly from the second step of the pipeline"
Note that sdsvc performs scaling of input data by default. This may be switched off using the 'noscale' option. Polynomial SVM optimizes degree and C parameters using a grid search. By default, the scaling is applied to the data (may be switched off using 'noscale' option). By default, sdsvc uses one-against-all approach to train a multi-class classifier. Separate grid-search is run for each of the sub-problems. One-against-all approach often yields very complex individual classifiers as each class needs to be separated from all other classes. Therefore, large numbers of support vectors are typically needed. An alternative is the one-against-one approach. Here, we build pair-wise classifiers that are fundamentally simpler. On the other hand, for a C-class problem, C*(C-1)/2 classifiers are needed. While for three-class problem it is three classifiers, for four class problem it is six and for ten class problem 45 classifiers! Note that perClass implementation of one-against-one SVM still returns soft output (see the special combiner in step 3) instead of commonly-used crisp voting. 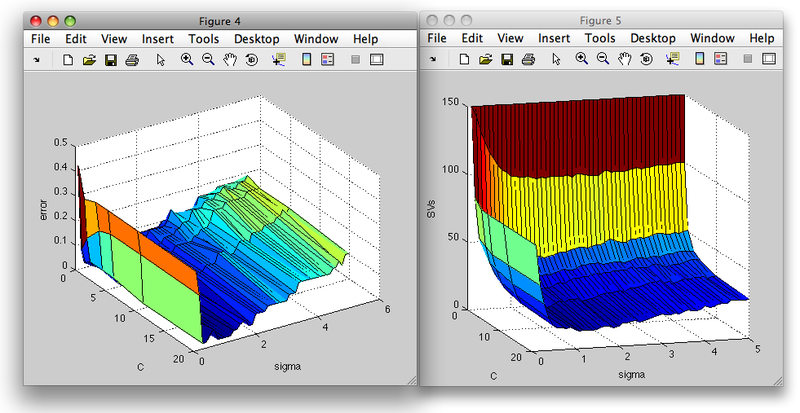 Therefore, we may perform multi-class ROC optimization as with any other classifier. A grid search is performed when sdsvc meta-patameters such as sigma and C for RBF kernel or degree and C for polynominal kernel are not specified. Grid search splits the data internally, uses one part for training the model and the other for evaluating model performance. This random data splitting leads to slightly different results each time sdsvc is trained. Note identical outputs (C, error and number of support vectors). In order to have full control on classifier training perClass offers a consistent way how to deal with internal data splitting. We may split our data set outside the classifier and use the 'test' option to provide the part used for internal validation.